King Severn Argentine’s fearsome reputation precedes him: usurper of the throne, killer of rightful heirs, ruthless punisher of traitors. Attempting to depose him, the Duke of Kiskaddon gambles…and loses. Now the duke must atone by handing over his young son, Owen, as the king’s hostage. And should his loyalty falter again, the boy will pay with his life. 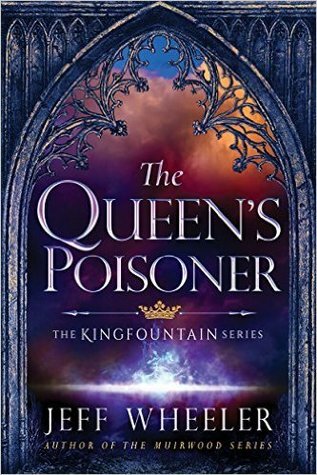 Seeking allies and eluding Severn’s spies, Owen learns to survive in the court of Kingfountain. But when new evidence of his father’s betrayal threatens to seal his fate, Owen must win the vengeful king’s favor by proving his worth—through extraordinary means. And only one person can aid his desperate cause: a mysterious woman, dwelling in secrecy, who truly wields power over life, death, and destiny. This book has been on my TBR list for a year and I am so happy that I finally got to read (Listen!) to it. It did start off a little slow which made me weary a bit so I am glad that it ended up picking up and being a interesting book. While the world at first made me a bit confused because what was fountain born, who was this awful king and what the hell is going on? Of course, I blame this partly on the fact that our MC is a 8 year old boy named Owen. While a surprisingly astute and reliable narrator he is ultimately a child so while I may have realized certain things before Owen did I could not blame him for being naive. The world begins to build itself as the story goes, and there are no long narratives we had to sit and listen to, but Wheeler did eventually end up answering my questions that I had at the beginning. As the story progress I felt myself wanting to play whatever dangerous game was going on, I predicted some things and was glad at how the book ended. The next book The Thief's Daughter makes me wonder what is going to happen as Owen will be much older and after the events of this book, must navigate the dangerous waters of spies and politics. I wouldn't compare this to the political intrigue of a book like Game of Thrones but it did have more than I thought it would. The fantasy and magic aspect is still a bit confusing for me, and considering that this book was called The Queen's Poisoner I thought it would have much more poison involved in the story. That it why I couldn't give it a higher score than 4, because I still had questions about the world building.